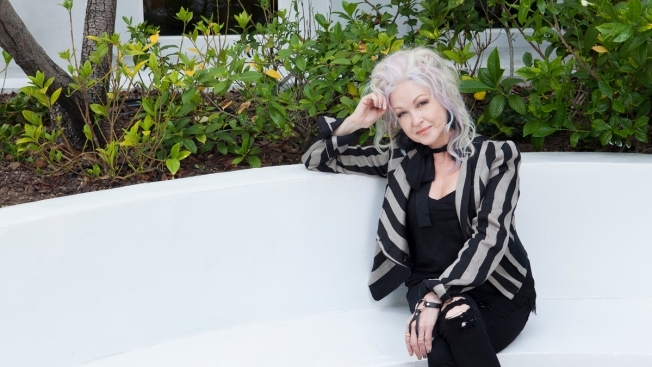 Musician Cyndi Lauper poses for a portrait at the Sunset Marquis, Thursday, June 28, 2018, in Los Angeles. Lauper is spearheading research into how state governments deal with youth homelessness - especially for LGBTQ youth. Lauper's True Colors Fund released a report Thursday measuring how each state holds up on providing services such as housing and mental health for homeless youth. She was in her late teens and ready to move out of her family's house, but her parents wouldn't sign a lease for her own place. She found a job at a restaurant, but that didn't pan out either and she ended up living on the streets and in a shelter in Vermont. "I felt like a failure because I couldn't even be a good waitress," the singer recounted Thursday morning to a small group of journalists in the courtyard of a luxury hotel off the Sunset Strip. She told her experience with homelessness, which came nearly a decade before she became a pop superstar in the early '80s, while unveiling a nationwide report on youth homelessness. The interactive report ranks how states provide services such as housing and mental health for homeless youth based on a variety of criteria, including access to hormone therapy for transgender people and testing for sexually transmitted diseases. It is a joint project between Lauper's True Colors Fund and the National Law Center on Homelessness and Poverty. Washington and Massachusetts ranked first and second on the list, with California and Connecticut tying for third. The lowest ranking states are South Carolina, Alabama, Arkansas and Wyoming. The report found that even in the top-ranked states, there's room for improvement in the availability of services, such shelters, counseling and training for identifying LGBTQ persons. They also said laws should be changed to decriminalize truancy and other policy changes are needed to keep vulnerable youth out of the juvenile justice system. Lauper said the report can be used as a tool for advocates to make a direct change in the way service providers across the country can assist and ultimately prevent youth homelessness. The singer said the fund will update its research annually. Lauper, 65, is best known for hits like "Girls Just Want To Have Fun", "Good Enough" and "Time After Time." Her debut album "She's So Unusual" had four top-five hits on the Billboard Hot 100 chart in 1984. It was the singer's own experiences with homelessness that inspired her to want to improve conditions for displaced youth, especially those from the LGBTQ community. She created the True Colors Fund, which advocates for services providers, such as shelters and clinics for homeless youth, in 2008. She also said she hopes the effort will inspire young people to contribute to the solution. "I was brought up in the civil rights movement and I listened to Dr. King all the time," she said. "I know that it was all of us that was going to make a change, not some."